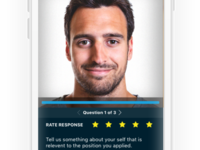 Wepow is a video interviewing solution that reduces interviewing time and improves hiring quality. We power organizations to hire better people faster and reduce costs while maintaining a personal connection. Hundreds of organizations including Adidas, Lenovo and Box rely on Wepow to improve recruiter productivity, deliver engaging candidate experiences, and make the right hires. WePow has been a life saver. As a recruiter in an emerging industry we depend on tech like this! Cons: Limited mobile capabilities. I would love to see better Live Interviews when using mobile devices to connect. Overall: I hire people. Fast. Thanks again WePow, Airfield loves you! Pros: The connectivity to candidates and how we are able to see how far the candidate is getting. Also being able to send them direct links to their own profile and how easy it is to connect with customer support. Cons: The export feature - I wish it was more organized in terms of being able to export the specific tabs i.e. dismissed candidates or incomplete candidates by name to help assist with certain reports. Clean, easy to use, excelent customer support, very poor in customizations and extremely expensive. Pros: Clean, easy to use, excelent customer support, very didatic in terms of how to record the interview and has a very clever step-by-step set-up and instructions. Cons: Poor in terms of customization and extremely expensive compare to the overall video interview market. Pros: As we have many overseas hires it is difficult to organise face to face skype etc. because of the time differences. Wepow saves us so much time and we can review the videos when we want. Efficient, the platform is friendly and a nice experience. 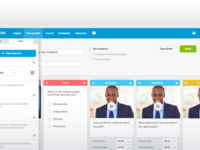 Pros: As an administrator, scheduling the interviews, is really easy to manage the platform and also for the candidates and interviewers is really easy to enter to the video interview. I like that the invites have tags and that we could personalize our invites. Cons: I want to send different invites to the candidate and the interviewer, and it isn't possible. It's complicated for the interviewers to contact the support team when they have a connecting issue, because they have their time measure, and sometimes the support spend a lot of time. Overall: I spend less time scheduling interviews and sending invites to the candidates an to the interviewers (I could check their agenda from Wepow). Pros: A fun and interactive way to do pre-screening. It eases the administrative burden of setting up pre-screening phone interviews. The system has a good way of putting the candidates at ease with some sample questions they can use and explanation of the process. 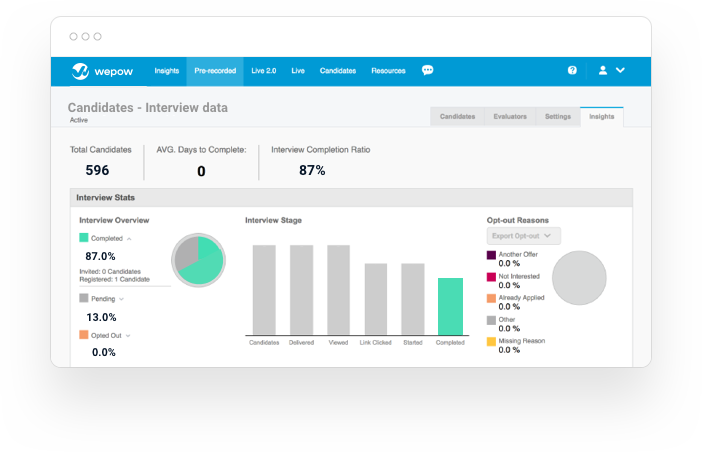 Hiring managers can be given access to view and rate the Wepow interviews, streamlining the hiring process. Cons: You can create template forum questions but the preview does not allow you to view the whole question or the answers if it is multiple choice. If you have 2 similar questions you cannot tell which one you are choosing. Overall: Saves time in finding quality applicants. Pros: The ability to connect live with the person being interviewed. This allows both parties to establish a rapport and makes the interview as though they were sitting across the desk from you. Cons: I should be easier to edit the date and time when changes are needed due to a change in schedule by either party. Overall: The benefit I like most is the ability to conduct a live interview with face to face capability. This personalizes the interview for both parties and provides a better means of making hiring decisions. Wepow helps make our recruiting process easier and more efficient! Pros: Wepow has great customer service and their website is user-friendly making it easy to use. The interface keeps our recruiting efforts organized. Cons: There are probably other features that we could use that we haven't tapped into. It can be a little overwhelming. Overall: Make the hiring process easier! Pros: The fact that I do not need to do as many phone screens is a huge plus. This helps short our time to fill. Cons: Sharing the WePows with hiring managers is not easy. I wish we had a tool to make this easier to complete. Cons: No archiving process - somewhere to store old interviews or invites away from your main feed. Pros: Ease of use for both candidate and customer. Not once have I ever had a candidate contact me and say there was an issue! Cons: Nothing glaring to share at this time in all honesty. From time to time there are glitches but I think they might be on the users end. 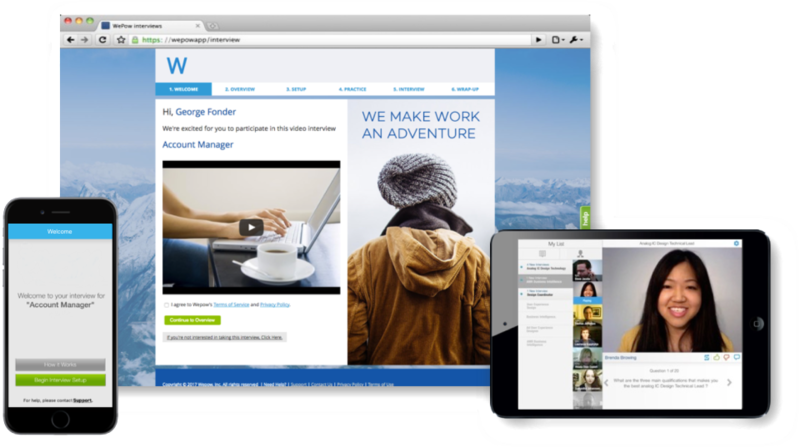 Overall: WePow helps speed up the recruiting process. I can send a link in a matter of seconds and it helps me get eyes on the candidate. I can also forward on to my Hiring team for them to review. I'm a regional recruiter interviewing candidates from all over the country while in my living room. Pros: I like the ability to see the candidates and their gestures before forwarding them to the hiring manager. This software enables me to do so much more than a phone screen would allow. I have the first true interview with candidates, so I can eliminate those who are not appropriate. Overall: My ICIMS connections are difficult and clunky. Some candidates have a difficult time logging on. Wepow video screened candidates for the manager's review on professionalism and demo abilities. 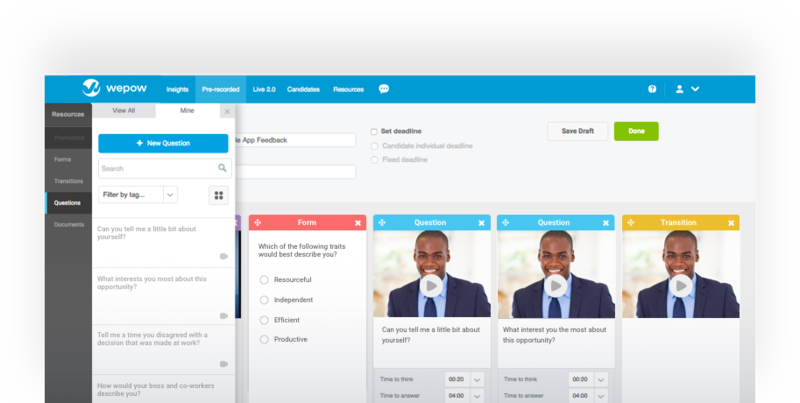 Pros: The ability to share candidates with managers, but maintain a limit for bias and candidate quality. Cons: Glitches within the system. A lot of my candidates had completed their videos, but missed one button and we are not able to see any of it. There have been a few times candidates have had to resubmit videos due to no audio, not their video being erased if not completed. Very effective and easy way to interview! Pros: It was very simple for everyone to figure out without wasting a lot of time. I was able to hop on and get working right away. Cons: The email communication can be a bit too frequent, however, it doesn't let you forget about your reviews! 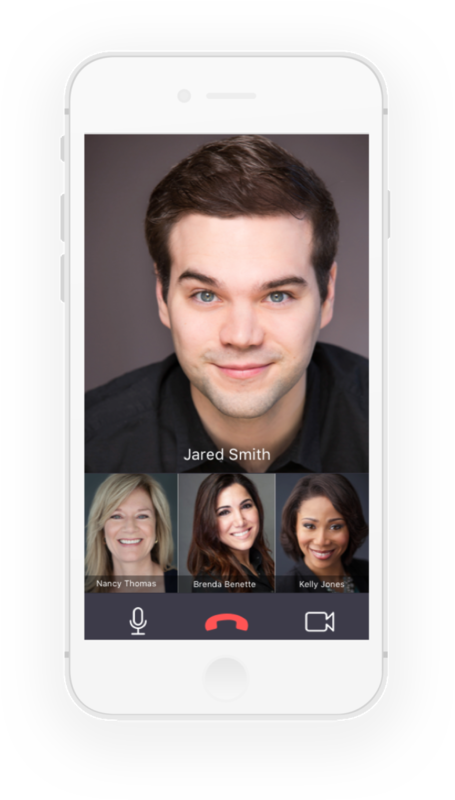 Overall: It was a very easy way to get a large amount of interviews completed without having to worry about technical issues from other video chat applications. My experience can be summed up in just a few words.. Amazing, FanTASTIC and superduperb. Pros: Things that i like most about this software is the fact i can so easily use it and look at all my favorite people doing interviews through my favorite interviewing tool! Cons: The things that i like least about this software is not being able to extract data as easily as other competitors - ouch! 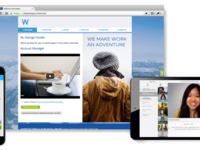 We utilise WePow to screen employment candidates and I have found it is very user friendly. Pros: The layout is easy to use, when viewing video responses everything I need is on the one page (form question answers, video response, rating, shareability). Super quick and easy to use for mass applicants. Cons: Some of the reporting functionality could be updated. There's only an option pull data and not to select the data you want. For example: when I want to know the average rating all parties have provided on a candidate - the report pulls all scores entered and I have to filter and figure out the averages. Overall: Ability to communicate with candidates, individually and as a group - and showcase our use of technology in our work environment. Pros: I like the ease of functionality with WePow. It helped us run through our pipeline much faster and monger in a good selection of candidates. Cons: Sometimes it was slow to load when trying to view candidate's answers. It skipped through some video segments also. It wasn't regular. The interface is generally slow and latency when recording is poor. Only use because it's policy. Overall: Ability to connect with candidates globally, although I usually use Skype instead. The product serves it's purpose. It's been able to handle an extremely high volume of candidates. Pros: We pay quite of attention to candidate experience, and we've heard nothing but positive feedback from that end. Cons: Some of the admin tools are a bit wonky and confusing, building templates could be a bit easier and the tool in general could use a little help on the UX side. Pros: We consider ourselves a company that continues to grow, we still need many talents in our company. We recently started using wepow given how small we are, we need many people and it has gone incredibly well! Cons: The truth is that there are very few things that I did not like, but if they could improve on some things. It seems to me that the visualization in different devices is not very good, at the same time, when you export the information sometimes it fails. 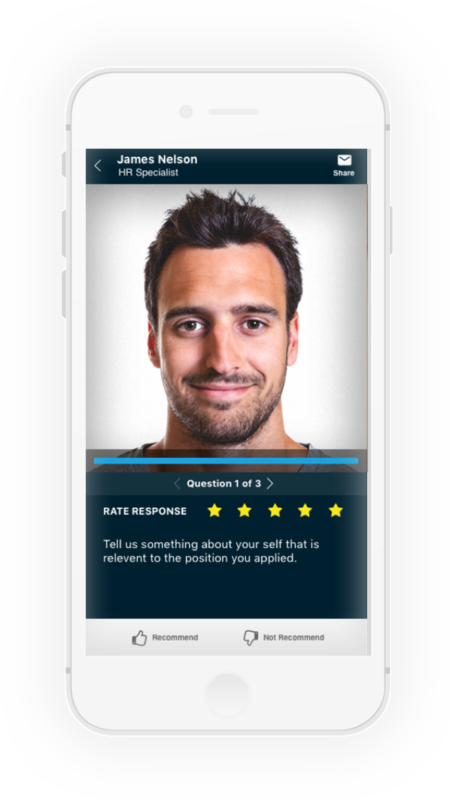 Pros: I like seeing the video interview before talking with the candidates, and I can rate their responses so my recruiter can see them. Cons: I think it should have a "done" button after I review the last response. When I watch the interview and complete the ratings, it just stays on the screen and I'm not always sure it's completed from my end. I think a "done" button with an exit message would let me know I don't need to take additional steps. Pros: It's intuitive to use, and the Help section has any answer you may need. It's easy to add evaluators and I like seeing that completion status on each candidate. Cons: I wasn't able to mix written questions with video recorded questions. I may be doing it wrong or my Company may have restricted a setting. 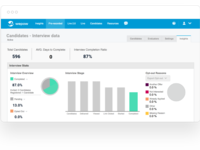 Overall: Faster and more comprehensive way to evaluate candidates...saved us from bringing in candidates for in-person interviews and wasting everyone's time. 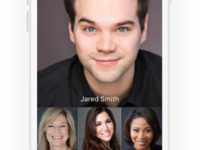 Overall: We are able to better screen applicants for jobs, as well as host interviews with external and internal candidates when Skype, Video conference or other video services are not viable. It is not my go to for internal and external video interviews. As my first time having a video interview, it was very easy and useful. Pros: Even if you are not in the same room with the other person, WePow makes you feel like you were! It gives you the full interview experience and provides you the quality tools that you need. Cons: The interface speed and the mobile capabilities could get better. When these two improve, WePow will be one of the best options! Pros: It is a faster filter regarding the basic requirements and It was able to have more assertivenesses. Cons: I only had some feedback from candidates that couldn't accomplish the deadline because the email went automatically to trash and some of the videos didn't have a good audio. Pros: It was easy to set up and use, with no technical issues when I used it. Instructions were useful and it made a stressful task that much less so. Cons: I could not replay my interview responses. The video quality of the questions was also not the best, and could have been higher quality. There was some lag. Pros: I really like how I can scan candidates quickly. I can decide very quickly if the candidate is someone I want to bring in for an interview. Much more effective that I a phone screen. Cons: I would like to option to rate a candidate as neither thumbs up or down. There are candidates that I am ambivalent about on video, but may want to talk to them anyway. I don't feel right marking the highly or negatively. Overall: This software provided an efficiency in our intern candidate review. Pros: Wepow is extremely intuitive and is very easy to use. Barely any training was required so I was up and running really fast! I also like the sharing capabilities and how viewers can provide feedback in the system. Cons: I wish there was a bit more customization options on the user side. It's great that there is a use of video capability, however, I had a tough time trying to bring this to life.